Region Ⅰ is the region of flow establishment. It extends from the nozzle exit to the apex of the potential core. The so-called potential core is the central portion of the flow in which the velocity remains constant and equal to the velocity at the nozzle exit. Region Ⅱ is a region of established flow in the direction of the jet beyond the apex of the potential core; it is characterized by a dissipation of the centerline jet velocity and by a spreading of the jet in the transverse direction. Region Ⅲ is that region in which the jet is deflected from the axial direction. 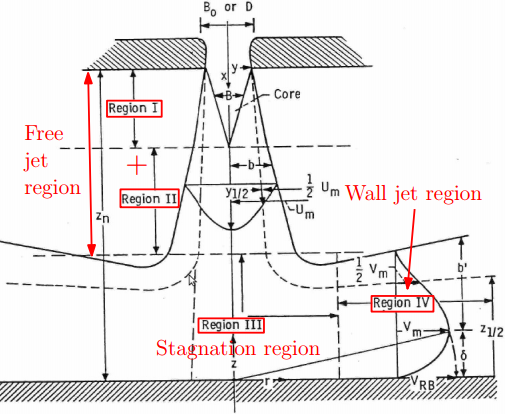 Region Ⅳ is known as the wall jet region, where the directed flow increases in thickness as the boundary layer builds up along the solid surface.